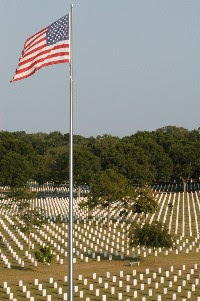 Today we honor and remember those who died in the the service of their country. Take a moment and thank them. "Western countries have designed plans to cause drought in certain areas of the world, including Iran," Mr Ahmadinejad said in the city of Arak in Markazi province. 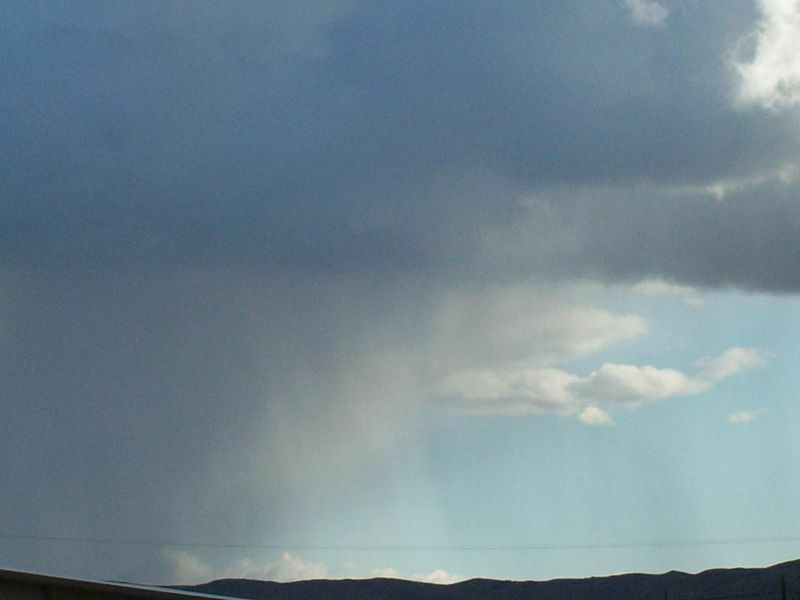 By doing so, "they prevent rain clouds from reaching regional countries, including Iran," Mr Ahmadinejad charged. 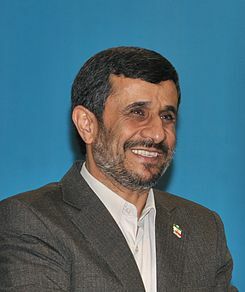 Next, Mr. Ahmadinejad, we'll be exporting tornadoes to plague you personally. We have plenty to share. 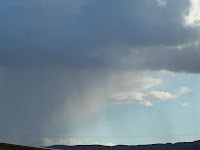 For another example of crazy theories of weather modification see here. Never in our history have we fought a war where law, lawyers, and layers of legalese have impacted all levels of the war, Political, Strategic, Operational, and Tactical. 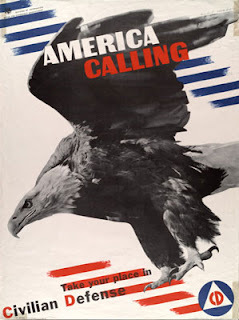 Why do we find ourselves here and in what direction are we going? From Pakistan, Afghanistan, Iraq, Libya and even domestically, the legal definition of the use of military power is evolving. 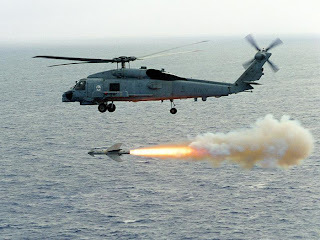 To discuss the impact of Lawfare for the full hour with Sal from the blog "CDR Salamander" and EagleOne from "EagleSpeak" will be David Glazier, CDR USN (Ret.). David is a Professor of Law at Loyola Law School in Los Angeles. Prior to Loyola, he was a lecturer at the University of Virginia School of Law and a research fellow at the Center for National Security Law, where he conducted research on national security, military justice and the law of war. He also served as a pro bono consultant to Human Rights First. Before attending law school, Glazier served twenty-one years as a US Navy surface warfare officer. In that capacity, he commanded the USS George Philip (FFG-12), served as the Seventh Fleet staff officer responsible for the US Navy-Japan relationship, the Pacific Fleet officer responsible for the US Navy-PRC relationship, and participated in UN sanctions enforcement against Yugoslavia and Haiti. Glazier has a JD from the University of Virginia School of Law, an MA from Georgetown University in government/national security studies, and holds a BA in history from Amherst College. So, with experience ranging from warrior to law of war scholar, Professor Glazier has some interesting (and sometimes unexpected) views on the matters described above. Join us this Sunday at 5pm Eastern as we delve into the world of "lawfare." 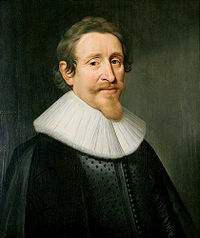 I promise that the name of Hugo Grotius will be invoked somewhere along the way. 2. 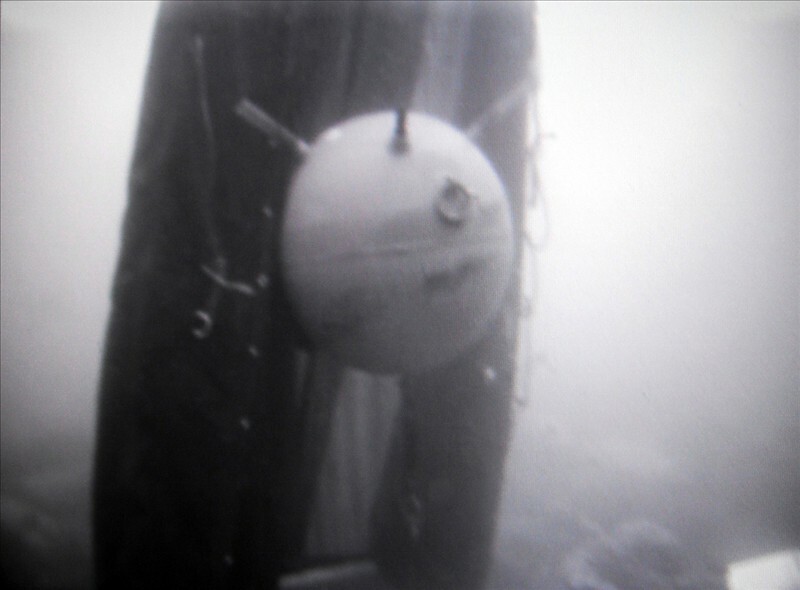 MINE COUNTERMEASURE OPERATIONS HAVE REDUCED THE THREAT TO SHIPPING. - REDUCED SPEED IN SHALLOW WATERS. IN THE PORT. 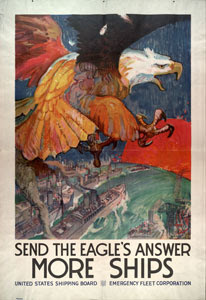 NATO DOES NOT CONTROL THE PORT. 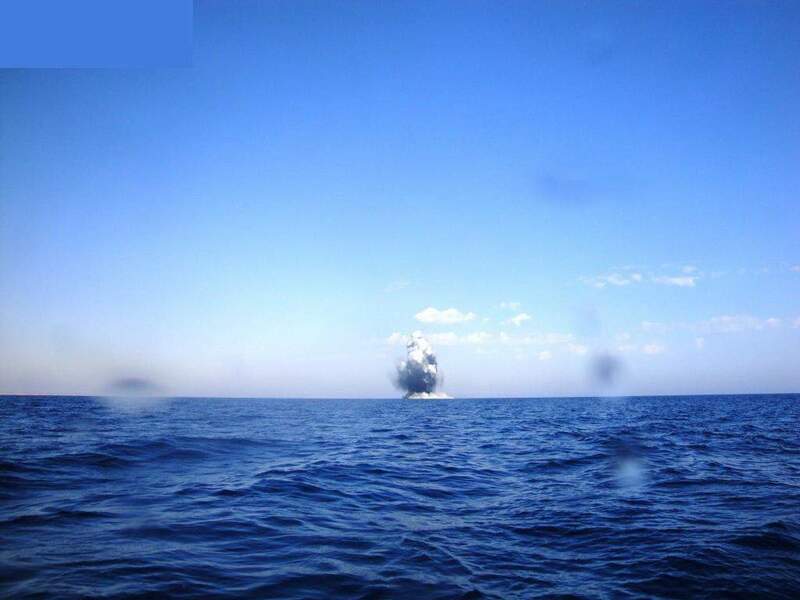 HMS Brocklesby, one of the Royal Navy’s Mine Counter-Measures Vessels, has destroyed a mine laid by pro-Qadhafi forces in the port of Mistrata on the Libyan coast. 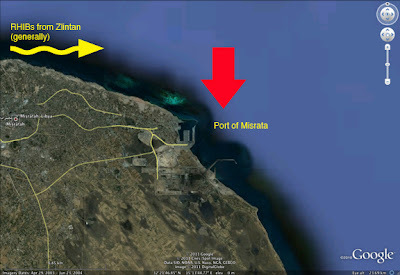 Forces loyal to Colonel Qadhafi have made repeated attempts to close down the port to limit the flow of humanitarian assistance to the population of Misrata. Using her sonar and Under Water Mine Disposal System, Seafox, HMS Brocklesby successfully located and destroyed a buoyant mine just one mile from the entrance to the harbour. 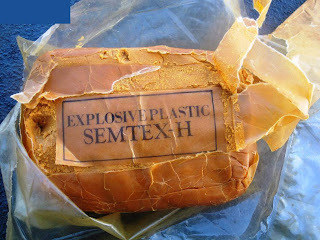 The mine, containing more than 100 kilograms of high explosives, had been crudely placed by pro-Qadhafi forces using an inflatable dinghy to transport it to sea. In the early hours of 16 May, maritime forces engaged in the NATO-led Operation Unified Protector detected two rigid-hull inflatable boats (RHIBs) that appeared to have deployed from the vicinity of Zlintan and were headed towards Misrata. 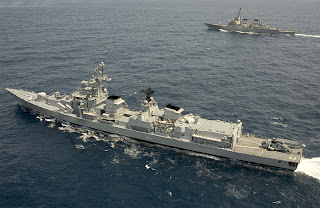 NATO forces reacted by sending warships and helicopters to investigate and identify the RHIBs. As NATO forces made their approach, one RHIB stopped in the water as the second escaped at high speed to the West, towards Zlintan. An explosive ordnance disposal team from an allied warship was deployed to inspect the abandoned RHIB and discovered a large quantity of explosives (approximately one tonne) and two human mannequins. 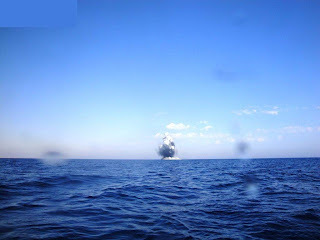 In view of the obvious threat posed by the explosives, the decision was made to destroy the RHIB at sea. This was carried out by the allied warship using small arms fire. This incident bore similarities with a recent incident, where pro-Qadhafi forces laid sea-mines in the approaches to the port of Misrata. However this is the first evidence of an attempt to use an improvised explosive device with decoy human mannequins to threaten commercial shipping and humanitarian aid in the area of Misrata. This is also the third incident in recent weeks where pro-Qadhafi forces have been active on the seas, a change in their operations that signifies their continued intent to bring harm to civilians or to attack NATO vessels. 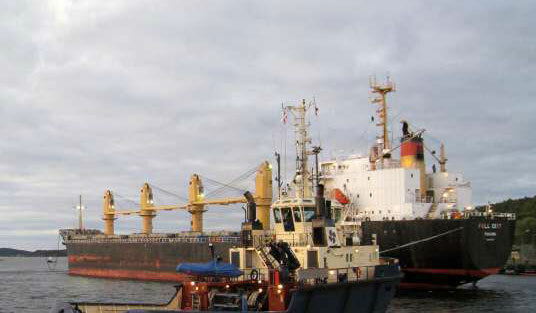 At 1310 UTC / 16 MAY / a previously hijacked ship MV EAGLE was reported in position 07 17 N 053 26 E course 260 / 7 kts. It is likely now that the ship is being used as a pirate mother vessel. At 1036 UTC / A merchant ship was reported under attack by a single skiff at posn 24 11N, 061 11E, small arms have been fired at the vessel. At 1639 UTC / 15 MAY / A merchant vessel was reported under attack by pirates. The vessel was fired upon by small arms. This vessel manged to evade hijack. The Pirate Action Group is still in the area. At 1112 UTC / 15 MAY / A Pirate Action Group consisting of a dhow towing a skiff was reported in at the above position, crs210, 5.0 kts. 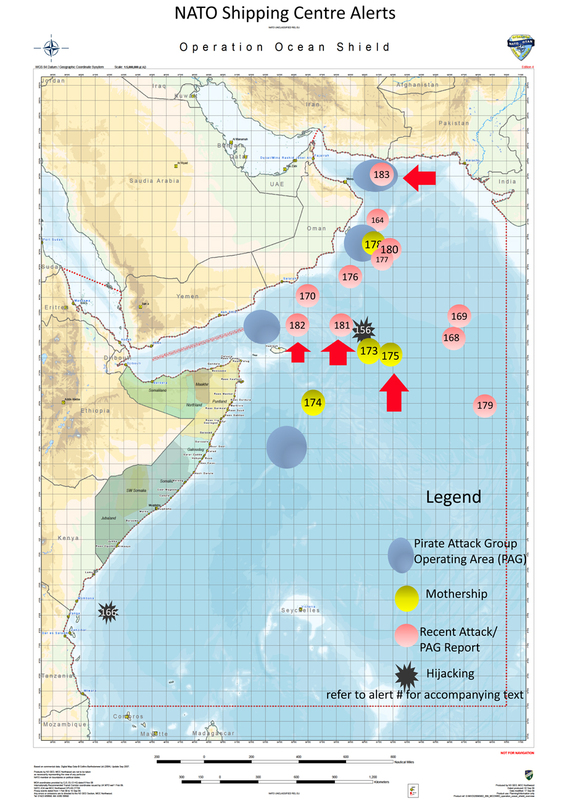 I added red arrows to the NATO Shipping Centre May incident map to point to the most recent alerts (175 revised, 183, 182, 181). 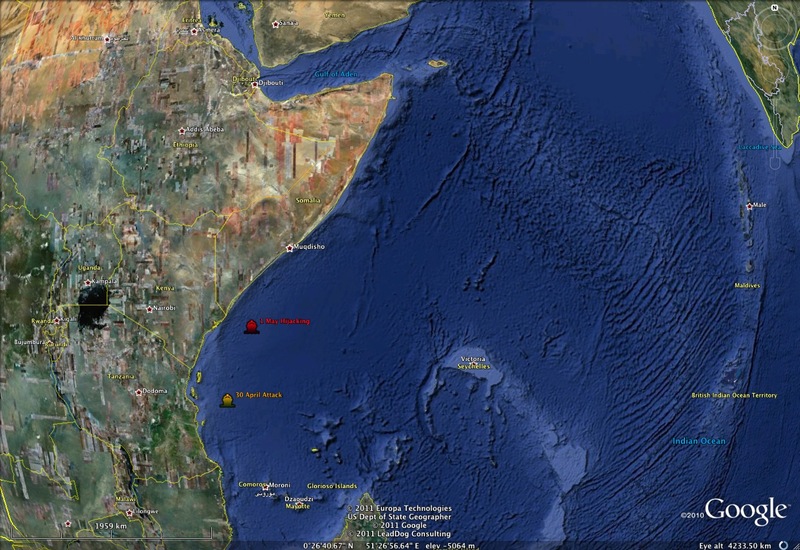 During patrols along the Somali coast on Thursday 12 May the morning approached ESBERN SNARE himself a pirate mother ship. Since ESBERN SNARE tried to stop the mother ship with Cry, was the pirate mother ship opened fire on ESBERN SNARE who immediately returned fire. Shortly after the exchange of fire was from the pirate mother ship tossed more weapons overboard and were showing signs of surrender. ESBERN SNARE subsequently took control of the pirate mother ship. On board the pirate mother ship, there were 16 Iranian hostages and 28 presumed pirates. Were also found several weapons and other pirate-related equipment. Following the gunfight, four suspected pirates killed. In addition, 10 others wounded, while 14 remained unharmed. 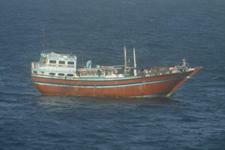 All ten wounded pirates treated on board ESBERN SNARE. They killed four suspected pirates have been buried at sea according to NATO procedures and taking account of Muslim traditions. The 16 Iranian hostages will be expected to look forward to an early reunion with their families. 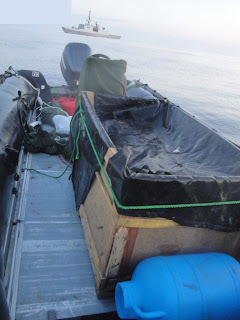 The 24 suspected pirates are provisionally detained on ESBERN SNARE, while the Danish authorities to explore the possibility of prosecution. A couple of weeks ago, I was out providing disaster assessment (DA) evaluations for the Red Cross in the areas smacked hard by the North Carolina tornadoes. The Red Cross uses the DA evals to estimate the financial needs of the individuals/communities struck by such disasters and, later, will talk with those impacted about getting them some temporary shelter, money for groceries, clothing and bedding (as needed). Everywhere the DA teams deployed, we saw the yellow shirted members of the NC Baptist Men disaster relief teams deployed, cutting up downed trees, clearing debris, helping with emergency home repairs and through their filed kitchens, providing meals to victims and volunteers. It's been nearly a month since the tornadoes hit, and Baptist Men volunteers have provided more than 8,500 volunteer days, completed more than 1,050 jobs and served more than 70,000 meals. Many volunteers are retired. Others use vacation time. All pay their own travel expenses and a small fee that covers housing, usually in a church, and meals, prepared by other N.C. Baptist Men volunteers. Dwayne Patterson, neighborhood services supervisor for the city, said the Baptist Men fill a huge gap by doing on private property what the city can't do and insurance won't pay for and residents can't afford. "And they're so efficient and so effective," Patterson said. "They've been able to get a tremendous amount of cleanup done that would have taken weeks or months." The work helps the whole community, Patterson said, not just those on whose property the Baptists labor. You might note in the comments that even these good deeds get challenged by people who either lack faith ("So although I don't believe in the bulk of the religious dogma that these folks do I can certainly appreciate the fine, charitable, humanitarian work they are doing. Its a conundrum that I'm all too aware of. I don't respect their beliefs but some of the good they do, evidenced here certainly gets my attention. That makes me think further that what's the difference what we believe or don't believe? Its the kind of people we are, aside from our beliefs, and what we DO and how we act toward each other that counts the most.") or who feel the NCBM gets too much favorable publicity to the detriment of other groups (". 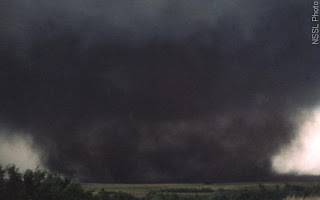 . . there are many individuals and groups that assist in disasters. But, these other groups are just not published about in this highly prejudicial newspaper that slants its articles in favor of the Southern Baptist Convention only."). I did see other organizations out in the field (Methodist Men, Samaritan's Purse, Salvation Army for example) and know they all made outstanding contributions to helping the victims. I did not see any organization of avowed atheists or agnostics out marshaling their resources to help anyone. Maybe they feel that their tax money is enough. Though members of all the charitable orgs mentioned above also pay taxes. The Office of Naval Research (ONR) intends to launch on May 16 a new Internet wargame, recruiting a community of more than 1,000 players to collaborate on solving real-world problems facing the Navy. 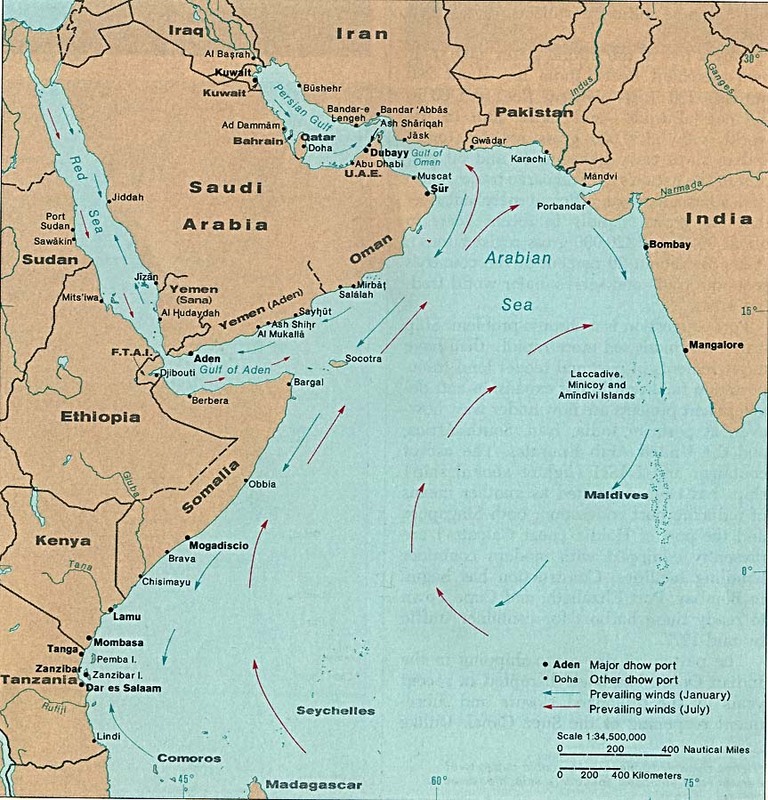 For the pirate-specific trial, I wonder how many "successful" strategies will involve not letting the pirates get to sea with their weapons and ladders?How many will involve an invasion of Somalia or a long, slow wait for some sort of civilization to assert itself over that failed land? Is there a "patience" meter? Will the game reward more "action" oriented strategies (chasing pirates) or more "static" strategies like blockading pirate ports of operation? I wonder how the game deals with alleged "allies" who show up to wave their national flag, but who don't really do anything meaningful to address the pirate issue? I guess the NATO/EU/CTF151 and all the other naval forces bobbing about in the Indian Ocean can take some solace in the fact that the numbers might be even higher without their efforts. You should also consider the number of attacks on merchant ships thwarted by armed security teams on board ships that came under attack by pirates . . . the IMB numbers are really only about 1/2 the story. An overcrowded ship carrying up to 600 people trying to flee Libya sank just outside the port of Tripoli, the U.N. refugee agency said Monday, citing witness accounts. 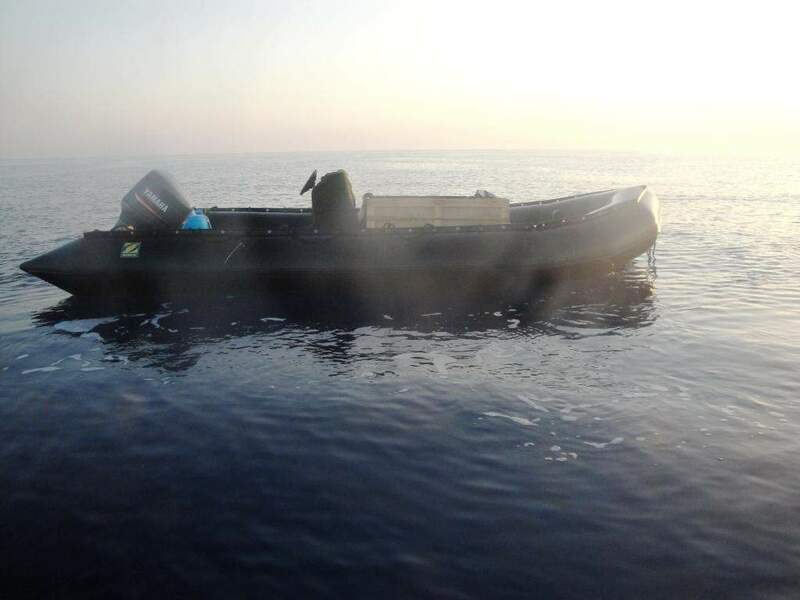 Aid officials were still trying to confirm the fate of those people after the vessel broke apart Friday in the Mediterranean Sea off the coast of Libya, UNHCR spokeswoman Laura Boldrini said. Witnesses who left the Libyan capital on another boat shortly afterward reported seeing remnants of the sunken ship and the bodies of some passengers floating in the sea, she told The Associated Press. The 24 Chinese sailors on board a Panama-flagged bulk cargo ship, hijacked by pirates yesterday at the Arabian Sea, have been rescued, as Turkey and U.S. navy ships in the nearby rushed to them and chased away the pirates, Xinhua News Agency reported. About seven suspected Somali pirates have left the ship, "Full City", and the 24 Chinese workers are found safe, locking themselves in the safety vessel of the ship, the report said. 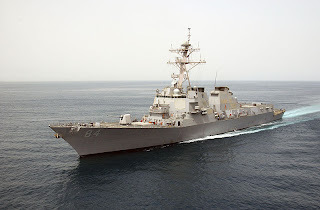 Guarded by U.S. Navy ships, a group of Turkey Navy commandos boarded the pirated ship. The pirates attacked "Full City" at midday on Thursday local time, and seized it about 450 nautical miles off the coast of Mumbai in India. 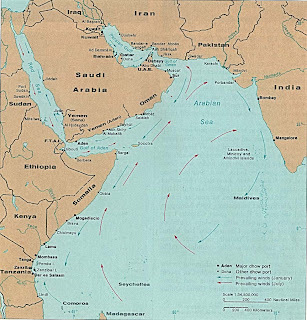 Upon arriving to M/V Full City, that was damaged by the rocket-propelled grenade and small arms fire of the pirates, communication with the crew of the ship was established. The pirates had boarded the vessel but the crew managed to lock themselves up in the safe house. Patrolling in the area, a Indian naval aircraft reached there and found a pirate mother ship next to the MV Full City and a skiff in the vicinity. 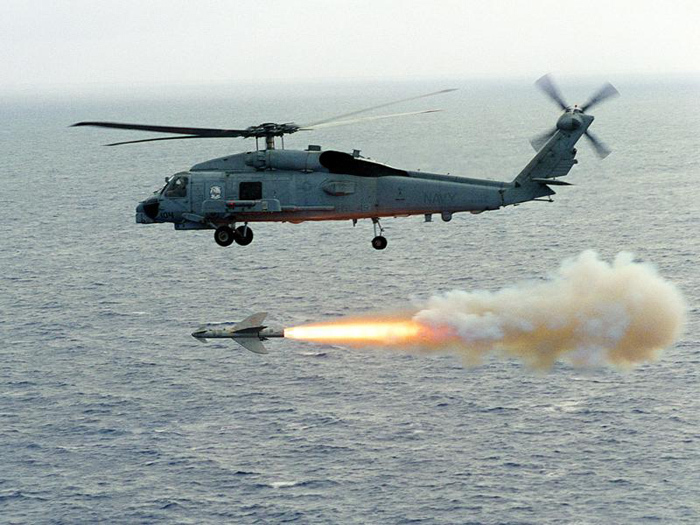 The naval aircraft warned the pirates on radio to leave the merchant ship immediately. Heeding to the warning, the pirates departed from the area at full speed. The ship was thus saved from being hijacked due to the prompt action. Full City photo by Tomas Østberg- Jacobsen from Shipspotting.com and used in accord with the terms of that site. Which may explain why there aren't many new posts. At 0733 UTC 01 MAY 11. A merchant vessel was reported hijacked by pirates in the above position.Two skiffs seen on board the vessel. At 0403 UTC April 30th A merchant vessel is currently under attack by pirates in the above position. The tanker, Gemini, was headed to Mombasa, Kenya when the incident took place, the Maritime and Port Authority of Singapore said in a statement. A distressed call was received at about 0350 GMT. Glory Ship Management Pte. Ltd. said in a statement Sunday that pirates are believed to have seized the Singapore-registered MT Gemini and its more than 28,000 tons of crude palm oil. 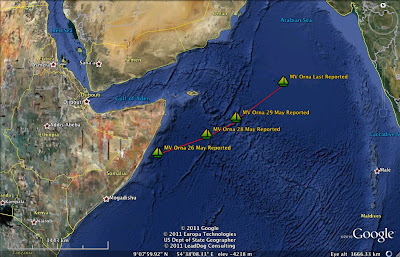 Glory said the ship was en route to Mombasa, Kenya, from Indonesia when it was believed to be hijacked and is now likely headed to Somalia.